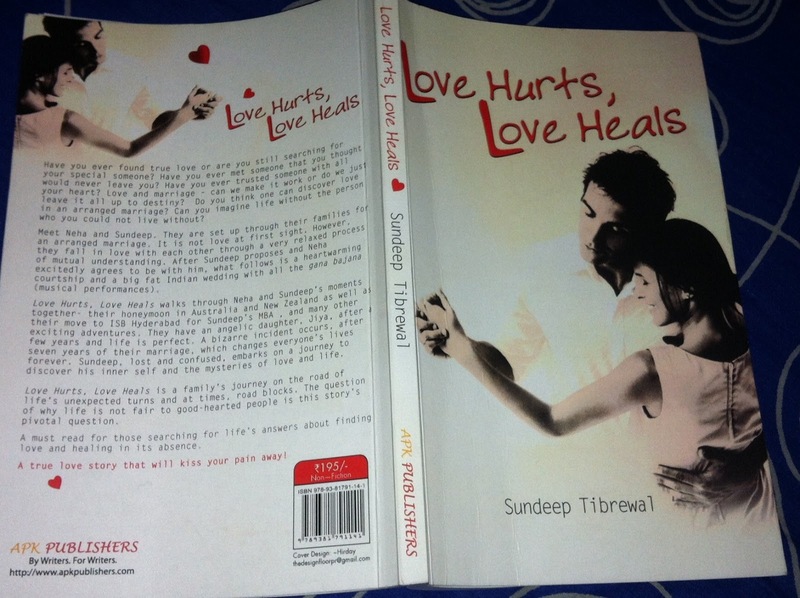 Love Hurts, Love Heals is a short yet stirring autobiographical account of the author Sundeep Tibrewal. The story begins with an interesting and absolutely enticing account of the author’s first meeting with his future bride Neha, every single slice of the event unfurling in the traditional Hindu pattern. After having exchanged mutual consents for marriage, Sundeep and Neha embark on their committed journey together, having promised each other to take care of their partner in sickness and in health. In the next few chapters the reader is taken on an imaginary ride through the many incidents of their married life – about Sundeep’s plan to enroll for one year of formal training in MBA at ISB, Hyderabad, how Neha accompanied him to the college campus and her compassionate deeds in company of the spouses gang to teach the caretaker’s kids during their spare time, their return to Kolkata, where they were originally based, at the time of Neha’s pregnancy, about Sundeep’s passion to make it big in entrepreneurship and finally, albeit most importantly about the marvellous time with their angelic daughter Jiya. Like a bolting from thin air, an egregious news shudders the very existence of Sundeep’s life and the later part of the book deals in length and breadth about the inevitable transformation in Sundeep’s life and how he finally came to terms with the unpredictable facet of life. The story Love Hurts, Love Heals, basically is a love story and as if to consolidate the goodness and purity of married life, the cover page is glossed with the shade white, exuding serenity and peace. I am not sure whether it was intentional, but after having completed reading the book, I felt that the cover, with the picture of the man and woman holding hands, was designed such that it would highlight the very essence of the story – love and peaceful existence. ‘ It was a very big decision afterall. I thought from the girl’s perspective and realised that it would probably be a bigger decision for her since she would have to become a part of a new family ‘ . Doesnt it shout loud about the sensible nature of the protagonist ? Lines like these convince the reader, for they state the otherwise untended truth in its rawness and make him/her trust the author, making the reader feel at home going through the book. Certain portions like the couple’s trip to Brisbane and Hayman’s Island, the hushed and zestful plans for Neha’s birthday celebration, the birth of their daughter Jiya and the overwhelming emotions engrained into the narration, all these were heart warming, for the author has sketched to life the very basic emotional undercurrents in any persons life. The part where the author describes the heart wrenching event that wrecked the smooth and enviable existence of his family is detailed in a poignant manner and one is sure to be left moved by the author’s mental turmoil. The author also contemplates in depth about the concept of Karma and after lives and about the probable explanations for the imbalanced fate curve of humans. The letter to his daughter that the author has knit to the story towards the end, speaks volumes about his love and concern for his daughter. The message that he tries to convey to his daughter is enriched with the lessons that he had amassed in his life time, mostly during the aftermath of the debacle. The revamping of the author’s normal life and the sequence of subtle changes in his routine subsequently, like his diversion towards spirituality and the heightened intense of his family’s care, depicts the resilient nature of humans and consolidates the meaning of the book’s title that ultimately, its love alone that heals the pain caused by its loss. The writing is lucid and the author has maintained an appreciable flow till the last page. In the afterword the author speaks about his wife Neha and the intention behind writing this book and the reader is sure to be left applauding the author for his commendable effort for upholding the cause. A fleeting thought on the whirlpool of emotions the author must have gone through while penning down the story brought a pang to my heart. The book serves as an eye opener for the malicious minds existing in our society who vye over trivial matters, for through his book the author proves that love is the sole meaningful expression and that love alone would bring sanctity to our lives. Recommended : To all readers who would love to indulge in two hours of evocative read. The admirers of books on subtle emotions of love would especially love this one. Sundeep Tibrewal is an author and digital marketing professional. He completed his MBA from the Indian School Of Business, Hyderabad. He holds a Master of Science in Engineering from Arizona State University, USA. Currently, Sundeep is the Director of NeoBVM. He was the Chief Product Manager at 9.9 Media, managing thir digital ventures, before NeoBVM. He has also conducted ‘Positive Thinking’ workshops for school students in Kolkata. Get in touch with the author at Love Hurts Love Heals Facebook Page or on his email lovehurtsloveheals2012@gmail.com. P.S : My sincere gratitude to the author Sundeep Tibrewal for having sent me an autographed copy of the book for review. P.P.S : The opinions that are part of this review are entirely the reviewer’s. This is not a paid review. I don't usually like love stories, but couldn't resist reading your review. This sounds like an interesting book !!! I am more of the drama and mystery genres myself, but then this one stood upto my expectations . Thanks Mixi for the wishes ! 🙂 Congratulations to you too on the silver batom . I had voted for you 🙂 Loved your story so much ! You assurance of a “stirring autobiographical account” laced with pain and fortitude may goad me to read the book sometime. I like how you have brought to the fore the pith of the book while preserving the turning points.